The WordPress.com stats helper monkeys prepared a 2012 annual report for this devotional. It was kind of presented in a fun way and I thought I would share. This devotion was started in July 2012! Here’s to another year of devotions in 2013! HAPPY NEW YEAR!!! On this past Sunday Night, my family and I watched the Nativity Story, which is a movie that details the story of Mary and Joseph and the birth of Jesus. There is one scene in the film that shows King Herod in the Temple in Jerusalem. He walks up to the the place where the sacrifices are being made and lays his hands on the horns of a bull, pressing his head up against the head of the bull. There a prayer is offered by the high priest, a prayer that supposedly transfers the guilt and sin of the King on to the bull. The bull has become the beast of burden. In other words, the bull takes on the burden of the Kings sins, which if you know anything about King Herod, those sins are many! The bull then faces certain death and has its throat slit, spilling its blood all over the place. This act of sacrifice, of transferring sin from the sinner to an innocent subject in order to appease an angry, wrathful God seems to be far from us. Or is it? Why is it that we say Jesus HAD to die for our sins? Why is it that Jesus is called the LAMB of God? What is it that we say Jesus did for us…that he took our sins and paid the price we deserve to pay…doesn’t that sound an awful lot like the same thing the bull did, only this time Jesus is the bull? Religions the millenia over have sought to find ways to appease God, or the gods (depending on the religion), hoping to repay God for the sins that they have committed. Does God really demand blood? Does God really demand our death for retribution? Or is this an image of ourselves that we project on God? Does God demand blood, or is it us who demand blood? And what does this have to do with Jesus birth? After all, we aren’t in the season of Lent yet, are we? While there are different scriptures throughout the Bible that will certainly justify the idea that God demands sacrifice to appease God’s anger at our wickedness, there are also scriptures that point us to an entirely different image of God. Today’s reading is such a passage. Rather than appeasing God with blood, God is asking us to appease him with a change of hearts. Rather than seeking the easy way out of our sins only to commit them over and over again, God is asking us to change…to truly change…and to walk humbly with God in the process. While we often see Jesus as the easy way out of our sins, as a way for us to transfer what we’ve done in order that we might be “saved”, Jesus seems to have had a different understanding of his purpose. According to his parable of the wicked tenants, Jesus came, with the authority of God, to show people what God truly wanted; however, rather than listen to what Jesus said, people rejected him and crucified him. It was sin that put Jesus on the cross indeed, yet the story does not end there. Jesus resurrects and gives us the opportunity to die to our sins and join him. How do we do that? But doing justice,loving mercy and walking humbly with our God. The birth of the Christ-child, the birth of Immanuel, the revelation of God being with us shows us that God is not seeking retribution but rather union with us. God is not seeking to punish us, but to commend us to his love and mercy. All we need to do is to “fear not” and see that God has come to us. We don’t have to search any further for God than our own hearts. Listen to what the words of the spirit are telling you, “Listen! I am standing at the door, knocking; if you hear my voice and open the door, I will come in to you and eat with you, and you with me” (Revelation 3:20). Amen! Come Lord Jesus! Jesus died because of our sins, and yet Jesus lives despite our sins. In Christ Jesus, sin and death have been conquered. Welcome to life as God truly intended it, all you have to do is claim it, live it, and share it! Lord, lead me to your eternal life and, through me, lead others. Amen. My family and I just got done watching a movie we watch annually during the Christmas season. If you haven’t guessed it by looking at the picture, the movie is “It’s A Wonderful Life” starring James Stewart and Donna Reed. It is a movie about a man (George Bailey) who has given and given to people, putting others ahead of himself and his own dreams, only to have other people’s mistakes crash down around him. None of his dreams of success, traveling or any other ones are ever realized. Sure he has a nice family, a lovely wife and kids, and sure he has had moments of joy in helping those around him. But deep down, there is a longing to have more, to be more, to finally have something he’s dreamed of come true. But this is real life we are talking about, not some tinsel town fairy tale, and Capra makes to give George a whopping double dose of reality. Instead of finding Bailey being rewarded for all of his kindness and generosity, instead of seeing him defeat the Scrooge like miser, Mr. Potter, and instead of seeing him amount to be more than a guy who nickels and dimes his way through life (literally), we find George facing fraud charges and prison time. His uncle lost $8,000 and George is going to take the fall for it, just as he has his whole life. It’s just not fair. So, this man, at wit’s end, finds himself at a bridge. He’s contemplating suicide, when he runs into Clarence, who is an Angel 2nd class. After wishing he were never born, and Clarence granting him that wish, he comes to the realization how hellish life would be for the countless people George helped in those years of personal sacrifice that he has come to regret. So, in the end he finds himself realizing what a wonderful life he has, and how happy he is to have his family. In the end, the town of Bedford Falls comes together and donates the $8,000 to George to save him from prison. This encounter with truth has changed his life forever. Some might call this a happy ending. I have often heard people say how Hollywood always forces in a happy ending. But in this film, I don’t know that I would call it a happy ending. Sure, he realizes what means most to him and how valuable his life really is, and that is a happy ending in that sense. But in terms of unrealistic Hollywood happy endings, this film does not have one. George may have his life back, but with that “gift” comes the reality that following Christmas he will go back to nickling and diming for the Business and Loan. The town members will go on in their poverty and need George’s help as much as they have always needed it. And the most terrible of all the truths, Potter will continue on misering, trying to ruin George and that miserable Business and Loan that always stands in his way. The real happiness of this film does not lie in unrealistic, sappy Hollywood endings. The happiness lies in the fact that when we help others, when we put others first, when we value others’ lives as much as we value our own, we end up entertaining angels. I am not one who espouses angel theology or gets enraptured by cute little cherubim. In fact, Clarence was borderline annoying to me in the film (I forgive him). Rather, the angels are the people all around George…and in fact, George is an angel too. He helped countless people, some of them even strangers, and in the end they all end up helping him. It is not so much that they help him financially because he has helped them all far more than they could probably ever repay. But, rather, they helped him in being present in his darkest time. It was in that dark time that George realized what angels they all were. It was when he thought no one knew him, when he felt the lack of everyone’s presence, that he realized that he had been entertaining angels his whole life. It is in that moment that he realized that he had neglected to see those angels for who they were; he had neglected to appreciate them and value them. Even in his selflessness he had been blinded by himself. But because he had been entertaining angels, they appeared before him in his darkest hour, when he needed them most. That is the beauty of Christmas! That is the heart of Christmas: recognizing that we are not alone in this world. If we recognize that we too have been entertaining angels, we might look up and see them standing all around us. Merry Christmas! May God bless you with the wisdom to recognize the angels in your life. Lord, help me to recognize the angels who are in my life, and humble me enough to realize the angel I am in the lives of others. Amen. It is hard to put into words the fear, anxiety, sadness, depression and confusion that ran through most people’s minds at the close of this past Friday, December 14. By the end of the day we had learned, following spending the day watching the drama unfold on live TV, that 28 people had been shot and killed at an elementary school in Connecticut. Out of the 28, twenty of them were children between the ages of six and seven years old. Often times, in tragedies such as this, people ask the question, “Where is God in all of this?” After all, what kind of God would allow children to be born and grow up in a world that is seemingly as evil as this one is? What kind of God would create “monsters” who go out and destroy those who are innocent? What kind of God would be so cold as to not intervene when the lives of the innocent are at stake? These are all valid and good questions to ask ourselves. It is also safe to say that there really aren’t any answers that fully satisfy our need to understand how evil and God co-exist? I could offer a ton of Christianese clichés that sound good off the cuff, but that would only be to simplify something that is very complex; so, rather than offering easy answers to really tough questions, I will provide one of many possible ways in which we can reflect on what happened and what our response will be. It is very easy for us to look at where we don’t see God only to miss out on where we are seeing God. For instance, we look at Adam Lanza and see his actions as a prime example of God failing to be with us. Yet, we also fail to see that God was with the principal who lunged at Adam and was the first to be shot and killed. God was with the teachers as they did everything they could, including cover children with their own bodies, to save their students. God was with the first responders. God is also with those who are looking at ways to address the societal issues that end up allowing people like Adam to fall through the cracks unnoticed until it is too late. When Jesus called his disciples to care for “the least of these”, that included those who suffer from mental illness. Yet, in our society, mental illness is stigmatized and our health care system often doesn’t provide affordable ways for people suffering from mental illness to get the kind of care (not just drugs and a locked asylum door) that they need. The fact of the matter is that bad things do happen. People have free will and choose to do all sorts of things that God would not wish for anyone to choose. But aside from that fact, we still have a God who loves us, a God who is with us, a God who provides hope even in the darkest of circumstances. The Nativity story is a reminder of the hope of Emmanuel, or rather, the hope of God being with us. This God came to earth and became one of us; this God put others first and sought to be present with all people, regardless of their status or condition. This God was crucified by God’s own creation and resurrected back to life despite being put to death. This God is the same God who was present with the teachers, administrators and first responders who worked desperately hard to save as many as possible, risking their own lives in the process. This God is the same God who is turning the media’s attention from labeling Adam as “the face of evil”, to looking at how people like Adam haven’t received the care they need. While we cannot definitively answer the question of why bad things like this happen, aside from the obvious answers, we certainly can still have the hope of Emmanuel. Let us not forget that God never leaves us, nor forsakes us. We can know that God is with us, and we can let God guide us to be instrumental in sparking the changes that are needed in the communities around us, the very changes that could protect other children and people from such acts of evil. Let us welcome Emmanuel in this world, by seeing God’s revelation in us. We have been equipped to be the presence of God in the lives of those in need, whether they are children in distress or Adam Lanza’s slipping through the cracks. Let us be like the writer of Hebrews who with confidence proclaims, “The Lord is my helper; I will not be afraid” (Hebrews 13:6). We need not look any further than our own hearts, and the hearts of those around us, to find God. Lord, I thank you for always being preset me, and thank you for revealing your presence in me. Let me witness to that Good News! Amen. A few years back a movie was released that got me thinking in a new direction regarding the birth of Jesus. The movie is called “The Nativity Story” and it follows Mary from the point of accepting Gabriel’s message of divine conception to her giving birth to Jesus in Bethlehem. While this film certainly displays the faith of Mary, and shows just how brave she would have to have been in order to accept such a path as God had laid out for her; however, it did not only show the courage and faith of Mary. This story also showed the immense faith, and faithfulness, of her husband Joseph. Of course, initially Joseph did not know what to make of Mary’s claim that God’s Holy Spirit had impregnated her. Can you seriously imagine what such a claim would sound like if you were on the receiving end of it? Who can blame Joseph for having his doubts. Yet, following a dream Joseph wakes up and decides that he is going to believe Mary. Now, he could have woken up and said, “Man if only that wasn’t a dream!” He could of woke up and carried on in his disbelief. But he believes the voice in his dream telling him to fear not. Yet, the story does not end there. There is a census that the Romans have ordered and Joseph must travel with his pregnant wife to the city of Bethlehem. From Nazareth, that is 80 miles that he had to travel on foot. Mary rode on a donkey while Joseph traversed on foot the dry, dangerous wilderness that lay between Nazareth and his final destination. Those words have stuck with me ever since. It is true that Jesus is the Son of God; however, it was Mary and Joseph who had raised him. It is true that God guided them, as God guides us all; however, it was through Mary and Joseph that Jesus learns who he is, whose he is, and what it means to be truly faithful. What a blessing Mary and Joseph must have been to Jesus, a blessing that God knew would multiply ten-fold in the boy that they were raising. The Word did not become flesh so that we sit back and admire it. Rather Jesus came to show us the way, the truth and the life; Jesus came to show us that we can be faithful and positively impact the lives of those around us. We can be like Joseph: though he wasn’t perfect and though he made his mistakes, he never gave up on his faithfulness to God, to his family and to those around him. Let us not just remember Joseph, but let us live like him. Lord, you are my guide. Lead me down the path of faithfulness just as you did with Mary and Joseph. Amen. Do you remember the story of Rip Van Winkle? It’s the story of a man who is well loved by the people in his village. He lived during the time prior to the Revolutionary War. Van Winkle’s major character flaw was that he was lazy and that he loathed any kind of “profitable labor”. His wife, Dame Van Winkle, is on his case about his laziness and he does anything to escape her nagging him. One day, while escaping his exasperated wife, Rip goes hiking in the mountains. While hiking he runs into a group of men who offer him some liquor to drink. Taking the drink Rip gets very sleepy and falls asleep. When he wakes up he notices that his gun is rotted and rusty, his beard is a foot long, and his dog is nowhere to be found. Heading back to town Rip makes the mistake of saying that he is a loyal subject of King George III. What Rip doesn’t realize is that he has been asleep for twenty year and that the American Revolution has taken place and the American colonies have won their independence from Great Britain. In today’s reading, Jesus is talking about when he will return at the end times and he warns his disciples that they need to be ready and to be always watching. He uses the metaphor of a servant who is caught asleep on the job by the master of the house who has just returned home. Not a good spot to be in if you are the servant. Jesus is warning his disciples that there is much work to do and there isn’t any time to be wasting. Many people spend their time, when reading verses like this, discussing and trying to predict the meaning in terms of Jesus’ second coming; however, I also see another profoundly powerful way of looking at what Jesus is teaching his disciples. In every question Jesus is given regarding the end of the world, he always points his disciples back to his mission and the urgency to carry it out. Another way to look at what Jesus was talking about is through the story of Mother Teresa. There were many times she felt like giving up, many times when she was tired, worn out, doubtful and on the verge of giving up; however, she never ceased to serve the marginalized and outcast people of Calcutta, India. She said that every time she looked into the eyes of the people she was serving, she saw Jesus. It is this persistent vision of Jesus in the faces of those she served that helped her to endure in the mission of Christ. This is what Jesus called his disciples toward. Rather, than sitting around and waiting for the master to return, rather than sitting around and waiting for the advent of the messiah, Jesus wants his disciples to live as if he has already arrived. Christ’s disciples are to see Jesus in everything they do, in everyone they meet and in every place they travel to. Christ is to consume us at every moment and, when that happens, we can be assured that we will not be caught unaware at the presence of Christ. Jesus doesn’t want a bunch of disciples falling asleep, like Rip Van Winkle, only to wake up and realize that Christ has come and gone. He doesn’t want his disciples to sit idly by while the marginalized and the needy continue to linger on without hope, healing, and wholeness. Disciples of Christ need to be alert to the presence of Christ in the world, and they need to never quit doing the work of Christ in the world. In fact, it is by doing the work of Christ in the world that we, as disciples, will truly see the presence of Christ! Let us be like Mother Teresa who, no matter the circumstances, never fail to see Christ in the people all around us! Lord Jesus, help me to see you in everything I see. Help me to be your hands and feet for everyone I see. Amen. What I love about the Gospels is that each one of them has a unique understanding of who Jesus is. Each Gospel uses the same key phrases to identify Jesus; however, each Gospel author has a subtly different understanding of what those key phrases mean. What is awesome about this is that by the time we are done reading the four Gospels we have a rich and diverse understanding of what it meant for Jesus to be the Christ, to be the Son of God, to be Son of Man and to be in the line of David. For this devotional, let us look at the Gospel of Mark. Jesus shows up at the Jordan river looking to be baptized. Mark doesn’t bother telling us a birth story or anything prior to Jesus’ baptism; rather, he points to Jesus’ baptism as being the ADVENT of the Christ. Prior to that experience in the Jordan, Jesus was just a peasant Jew from Nazareth. He was the son of Joseph and Mary, he was a laborer by trade and he had certainly known what it meant to work with his hands. But when Jesus comes out of the water, upon being baptized, he sees a vision of the sky opening up and light descending upon him like a dove. If we read Mark carefully, we will notice that Jesus is the one seeing this. In Matthew, everyone sees and witnesses this, but in Mark (if we are not reading anything in between the lines) it is only Jesus who sees this happen. And then Jesus hear’s the voice of God telling him, “You are my Son, my beloved, with whom I am well pleased.” It is at that moment that Jesus’ former identity that he had been born and raised to believe about himself falls away. It is at that moment that Jesus understands his TRUE identity, and it is at that moment that the Holy Spirit drives him into the wilderness to be prepared for the work God is calling him to do. For me, this is significant! We can relate with this Jesus because we too grow up not really knowing who we are. At first we identify ourselves by who are parents are. Then we grow up believing that we are what our society tells us we are. But at some point, if we open our hearts and allow the Holy Spirit of God to speak to us, we begin to understand that our identity does not rest on what the world thinks we are and it does not rest on who our parents are; rather, our identity rests on who God says we are! And when we find our identity in God, there is nothing that is going to stop the transformation that will occur. Some will not like that change. Some will fear that we’ve lost our marbles. In Mark, Jesus’ own family (including Mary) think Jesus has gone completely insane and they try to take him back home. They don’t like this NEW identity that Jesus has taken on! Yet Jesus persists in his ministry and in serving God and identifies those who do the same as being a part of his TRUE family. What is encouraging about Mark’s take Jesus is that it mirrors our very own experience as human beings (after all Jesus was not only truly divine, but also truly human). We often find ourselves soul-searching; we often find ourselves seeking our identity and looking for a deeper meaning and purpose in our lives. If we would only wash our self-identification away and emerge from the waters with an open heart, we too would hear God calling out to us, “You are my child, my beloved, with whom I am well pleased.” This is the identity Jesus called people toward, this is the Good News that Jesus preached throughout Galilee and Jerusalem. This is the Good News that Jesus calls us to bring to those who need to hear it, not only in our words, but by our actions. Let us bear that Good News in all that we do! Lord, thank you for reminding me that I, too, am your child. Let me, in my actions, be a reminder to all with whom I cross paths. Amen. Then when the list has been had, Stipe sings that “It’s the end of the world as we know it, and I feel fine.” Come again? You feel fine that the world is coming to an end? Some Christians make it their living to “warn” people of the impending doom that will befall the earth in the last days. Many people spend their lives speculating what the end will be like, when it will happen and the devastation that will be wrought. And now that we are in the year 2012, many people are worried that the Mayans might well have predicted the end. Yet, Michael Stipe is singing that he feels fine about this? Now, I am not going to put words into Michael’s mouth; however, I was reflecting on the lyrics of this song and what they mean to me. When we watch television, or read the news online, we often see apocalyptic images spreading around the world like wild fire. Tensions are high, people are afraid, and soothsayers are ever active in predicting the end. Yet, as Christians, we ought to know that God does not wish destruction upon the earth. Yes, an entire book of the Bible is devoted to talking about the end times and yes, Jesus talked about such times too; however the point was not to scare people as much as it was to give people hope. While the language is that of GOd reigning justice down, Revelation and other texts like it are more pointing to the destruction the earth has wrought on itself and the consequences of such destruction. 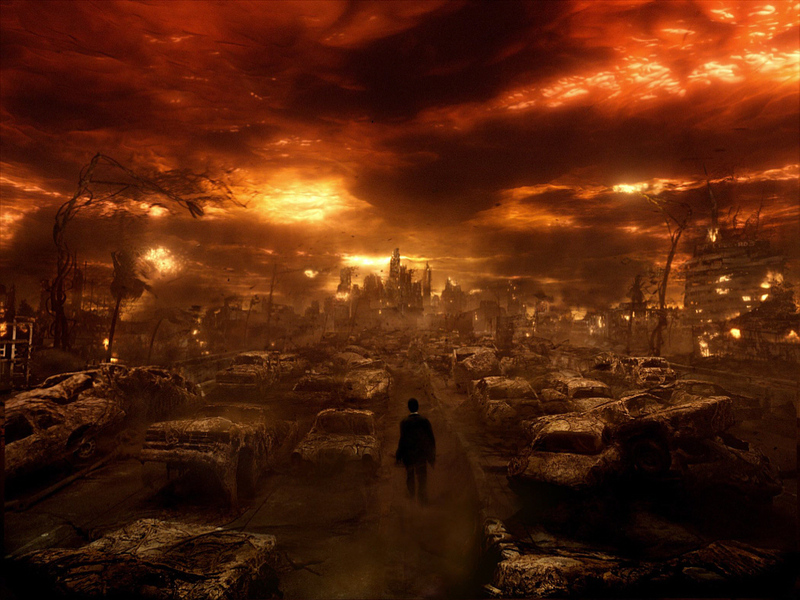 Just look at the war riddled world and you can easily see images of Revelation. So what is hopeful about this? The hope is that redemption is not only on its way; however, it is here. As we approach Advent, we often reenact the “coming” of Jesus and, in Revelation, we look forward to the “second coming” of Jesus. But, what we fail to realize, is that Jesus has already come again…in us! All four Gospels tell of Jesus talking about the gift of the Holy Spirit, given to those who believe. The Holy Spirit that dwells in us is ever working in changing the world around us. But, in case you didn’t get the memo directly, we are to be ACTIVE players in that. Rather than pretending to be awaiting for the first coming and rather than anxiously awaiting the second coming, perhaps we Christians should be actively living the coming of Christ in us! If more Christians lived out their Christianity in ways that made a difference to those around them, and less worried about event that are completely out of our control, then perhaps we would usher in the end of the world as we know it. Perhaps, instead of a world of suffering, pain and chaos, we could usher in a world of hope, healing and wholeness. Perhaps instead of a broken world, we could help usher in a world of togetherness, of community, and of LOVE. And if that is what it means to usher in the end, how can we not feel fine about it? This is what it means to be Christian: to usher in the end of the world as we know it. It’s time to get to it! To be made in the image of God means that we are made in the image of love. Lord, I am your servant. Help me to usher in the end of the world as we know it through your love. Amen.